Good morning and happy Monday! Thank you for joining #ThatBusinessShow on the start of your week! As you may already know, #ThatBusinessShow airs live every weekday at 8am on #1250WHNZ and on http://www.tampabayradio.com! So don’t miss out on the #MorningWithaMeloni and make usre to tune into the show! Today on the #MorningAir we featured Dr. LJ Rose, Author, Therapist, Wellness Educator and Expert on suggestive states! On the next segment, we welcomed Ben Wieder, founder of Level 6 Marketing! If you missed out on these wonderful guests being interviewed by our Host, Jamie Meloni on the #MorningAir, then head over to http://www.tampabayradio.com to listen to any show on demand, and also check out Jamie’s YouTube Channel to watch any of the live streams as well! Thank you again for joining us every weekday at 8am on #1250WHNZ! 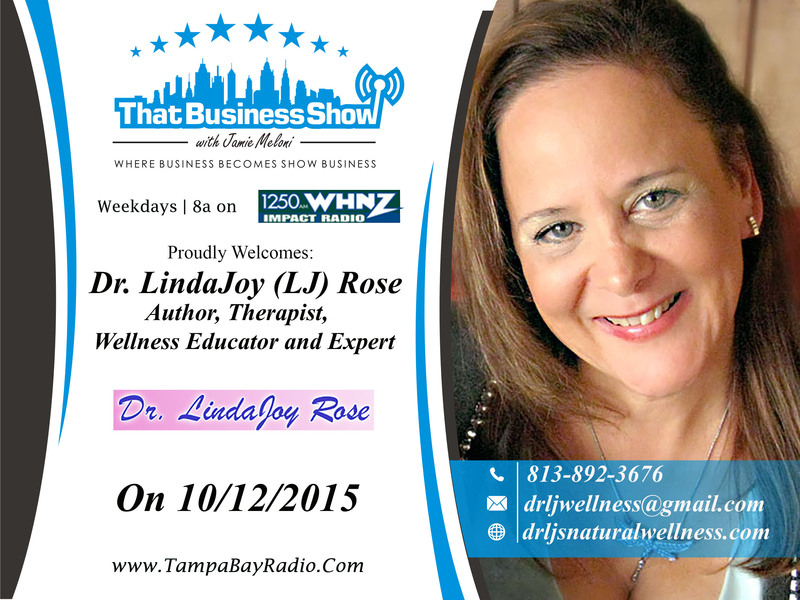 First up on #ThatBusinessShow was Dr. LJ Rose, Author, Therapist, Wellness Educator and Expert on suggestive states. With many titles under her belt, LJ is a profession wellness provider with years of experience and knowledge in many fields of alternative medicine. She is a pioneer in the training and implementation of hypnotherapeutic training and subconscious dynamics world-wide. LJ has created many original therapeutic modalities used to help overcome trauma and phobias and help individuals access their highest potential. She is also the Founder of the Natural Wellness Academy, now operating in 9 countries! Dr. L J has authored 8 books and has many consumer programs that help improve mind, body and spirit health and well-being – of which you can find out on her website! To learn more about Dr. LJ Rose and all of her publications and programs, head to http://www.drljsnaturalwellness.com! 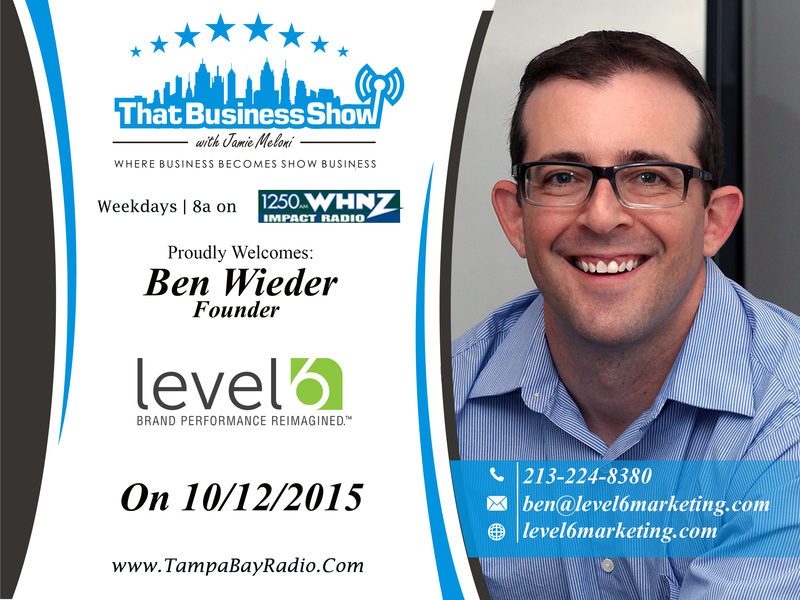 Our last guest on #ThatBusinessShow was Ben Wieder, founder of Level 6 Marketing. With a heavy focus on brand performance, his firm has helped multiple clients achieve improved ROI by leveraging the very latest technological innovations. The firm’s specialized capabilities include brand development, online training, customer incentives and content marketing. Current clients range from well-funded startups to multiple Fortune 500 corporations. A repeat offender, coming on #ThatBusinessShow the second time now, he mentioned our growth in which we are quite proud of! Jamie and Ben spoke a little about marketing changes in huge companies like Google and Wendy’s and such, and mentioned how simple things like changing your logo can bring people in! If you missed Ben Wieder and the great discussion on the #MorningAir, then head to http://www.tampabayradio.com to listen to the show! This entry was posted in Articles, Entrepreneurship and Business and tagged business, radio, show, talk, video marketing. Bookmark the permalink.